24x Case - (2.25/ea) - Free Shipping! 72x Case - (2.00/ea) - Free Shipping! 5x Dark hot chocolate. Like Drinking an 80% chocolate bar. In Amsterdam, chocolate houses dot the city landscape serving fragrant chocolates of every kind. They LOVE chocolate. Dark, thick, full-bodied, fragrant chocolate. Our cocoa is named in honor of that fine city and its famous Dutched treat. 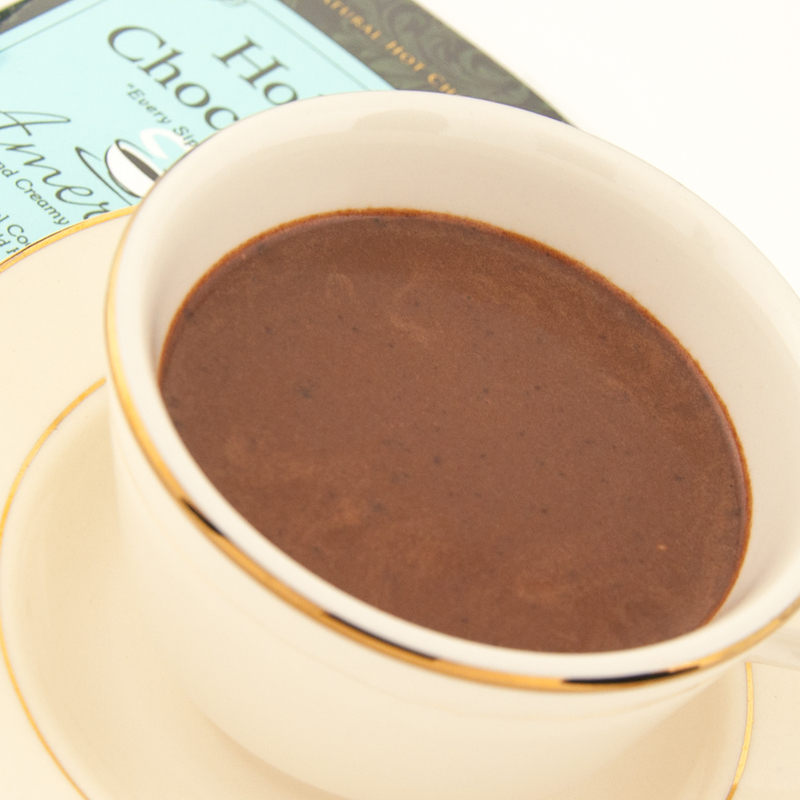 This is our darkest, richest hot chocolate, made specifically for the diagnosed chocoholic. Earthy without bitterness, rich without cloying sweetness, this is like an 85% chocolate bar in a cup. It is the succulence of the rain forest paired to Europe’s elegance. Most Americans have the idea that a dark chocolate is supposed to be bitter or sharp in taste. Maybe this idea came from childhood when we would steal our mothers unsweetened bakers cocoa as kids and try to eat it. Raw or unprocessed cocoa is harsh and has a sharp taste that is like mixing chocolate with Vitamin C powder. It’s really a unique and unpleasant experience to taste it. “Dutching” adds an alkali that rounds out the acidic taste of cocoa to what we are used to today. American styled chocolate is more acidy than its Hollander counterpart. The darker the color the lighter the taste. Dark Chocolate is not a matter of its intensity, color, or sharpness, but rather a matter of cocoa content. That is, how much cocoa is in the product by weight . 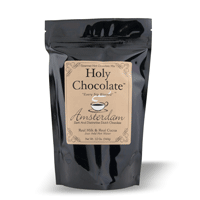 All of the Holy Chocolates have a high cocoa content, but the Amsterdam has the highest cocoa content. Even more than the European which is a very dark chocolate. 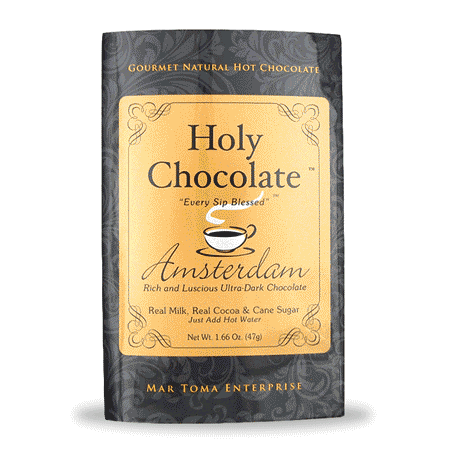 The Amsterdam powder seems to have hit the sweet spot in terms of its creaminess, chocolate taste and low acidity. Its so creamy and balanced that we removed sugar from the recipe to make room for more cocoa powder. 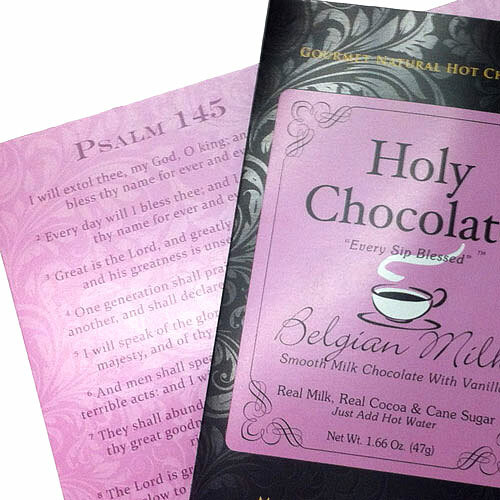 This is the least sweet of any holy Chocolate variety. But it isn’t sharp to the tongue. Its just strong. 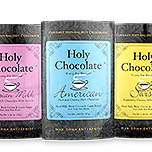 If you never have had Holy Chocolates before then you should know that even the Swiss is pretty strong, and the other varieties get stronger from there. But some people were saying that even our European wasn’t as strong as they would like, so we made our supremely dark chocolate. One of the principals of Mar Toma Enterprise wooed his new woman with the Amsterdam (they are getting married soon). We are sure it will woo even the most sophisticated chocolate lover. Definitely for the confirmed chocoholic. One serving has 1.66 oz. of mix (almost 70% more than some brands) so that the milk is perfectly reconstituted and the chocolate taste is profound. One wouldn't add more chocolate, but you wouldn't take any away either. You'll just want another one later. 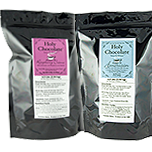 All our mixes, only use real cocoa and real dried milk from pasture cows that are free of added rBST and antibiotics for an incomparable taste. There are no artificial additives, preservatives or fake milk mixes. "Heavenly things for a Heavenly people!... As is perfectly right!" 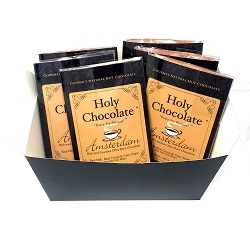 CNN Money Review of Holy Chocolate by Michael Turbach, author of the book "Hot Chocolate"